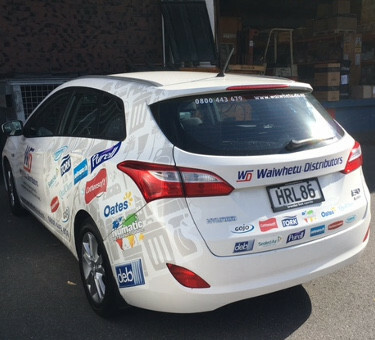 Take a look at our selection of testimonials from companies around New Zealand that already use Hyundai Fleet to provide their customers with the service required. By being a Hyundai Fleet customer, everyone of these businesses benefit from our nationwide network & extensive staff experience. Will your business be next to join the list? 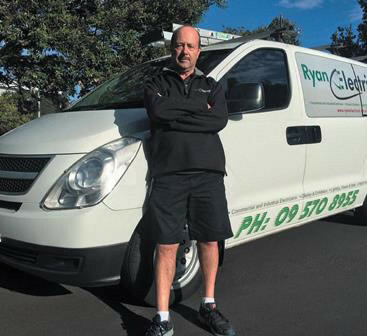 In our 21 years of business we have learnt the need for trade vehicles that are large enough to easily work from, yet still easy to negotiate the busy streets around greater Auckland. We have just upgraded the last of our Hyundai H100 vans to brand new iLoads and are proud of the image they project for our company. I find the iLoad helps identify with the image we strive to maintain. Our clients appreciate that we can carry most stock items on board for efficiencies, as the shelving units and racking systems make storage easy. All of our staff take pride in their iLoads and feel safe operating the vehicles that are packed with safety features such as reversing camera, dual SRS airbags & Electronic Stability Control (ESC). We made the decision to change our fleet of 21 vehicles to Hyundai in 2011. This followed a comprehensive evaluation of several competitor brands based on: vehicle performance, safety features, specification levels, carbon emissions; and whole-of-life costs. The clear winner ticking all the boxes was Hyundai, who have proven to be a great choice. The wide range of vehicles caters superbly to the differing requirements of our drivers. 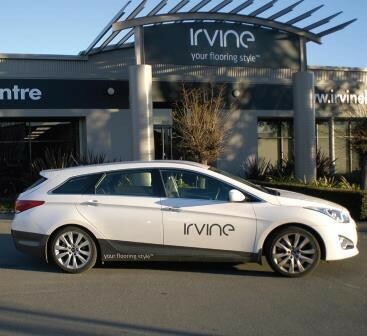 Our fleet includes the ix35, i40, i45, Sonata and Santa Fe. All vehicles come with high standard specifications resulting in driver comfort and safety. The fleet is extremely efficient to run and very reliable. 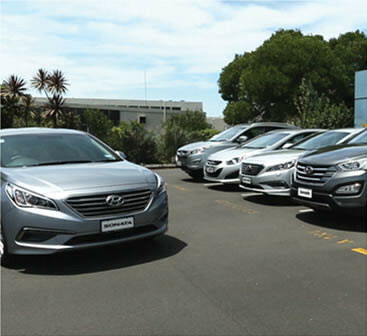 Manukau Hyundai provides exceptional service in a friendly and professional manner. It’s a great example of a business relationship where value is added beyond the initial vehicle sale. 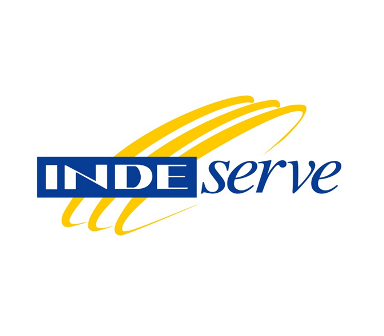 IndeServe has 15 Hyundai iLoad light commercial vans that we have been using for the past 5 years. Our technicians carry out work on customer premises and drive them to these locations often carrying ladders and materials required for the job. When we assessed the market we found the Hyundai to be an effective light commercial van for our use but it drove like a car and was much more comfortable than other vans. These vehicles have not let us down in use. Our technicians continue to enjoy driving them every day. 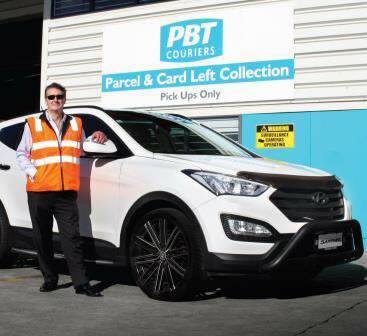 It is now 10 years since PBT first engaged the services of Hyundai Fleet. We were looking for a vehicle provider that could supply a range of diesel vehicles not just for our commercial fleet, but also our company cars for Sales Representatives and Branch Managers. PBT settled on the H100 initially, and later the iLoad vans, along with Santa Fe, iX35 and i30 passenger cars; all diesels. The change to these vehicles was significant both from a financial perspective with running costs, fuel efficiency and reliability. A surprising outcome also was the acceptance and embracing of the change to the vehicles from our staff as these vehicles have exceeded all users’ expectations. When PGG Wrightson went to the market we required a diesel vehicle that was ‘fit for purpose’. Being a national agricultural and livestock company, we needed a vehicle that looks professional and still be able to get us everywhere including to the back of beyond. We chose the Hyundai Santa Fe because it met all of our requirements including 5-star ANCAP safety rating, dependability and reliability, all-wheel drive with good ground clearance and driver comfort. In addition, being diesel, it provided a reduction in our carbon footprint along with good fuel economy. We also look very closely at the total cost of ownership of our vehicles and as we have now purchased more than 700 Santa Fe, that is our endorsement as to the quality cost effectiveness of these vehicles. When we went to the market, we ran like- for-like comparisons on a range of similar vehicles across different brands. Ultimately it came down to great features, excellent fuel economy, total cost of ownership and a ‘fit for purpose’ vehicle. We found the diesel i40 Wagon Elite to be far superior in all the aforementioned requirements. Our staff love the finish, finer features and quality of the i40. Its flexible seating and large cargo space are great for carrying substantial weights and the i40 performs exceptionally, even with a heavy load. Since driving the i40 Wagon, our running costs have dropped by about 50% already. As a company committed to environmental sustainability, this is important to us. We first purchased a Hyundai Diesel iLoad in 2010 and now have three in our fleet. All of our staff prefer driving these vans as they are comfortable, obtain excellent vision and drive just like a car. We have been purchasing vehicles from our local Hyundai dealer now for the past 5 years and have found them very professional and helpful. They are always very approachable, and although we are a small customer, they certainly look after us. The guys have had so many comments from people saying how smart they look, especially with the signwriting adding to the appearance. The fleet is economical and has excellent fuel consumption. 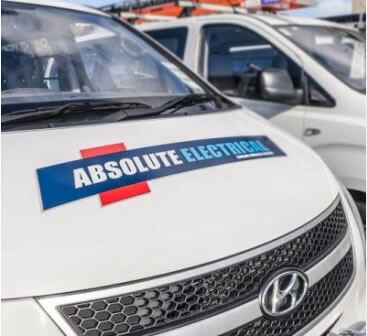 This makes them easy to recommend to fellow electrical contractors, who have gone on to purchase iLoads of their own and are really happy with their choice. 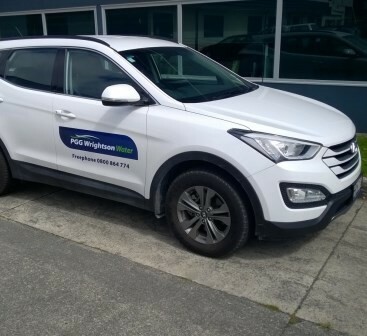 As the Auckland branch for New Zealand’s only professional football club, the Wellington Phoenix Soccer School partnered up with Hyundai Fleet for our future vehicle requirements around the region. Hyundai’s professional approach to us as a new customer, combined with their excellent level of customer service, made them a great fit to support what we as an organisation are about. The look and feel of our Hyundai Accent has proven to be a real winner with our new development coach; Tom Fawdry. 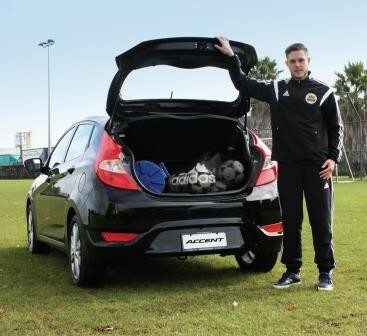 Even though it is a small car it has more than enough room for all of his training equipment & balls, and it’s because of this all round practicality that we will ensure the rest of our coaching staff drive Hyundai vehicles too. When the time came to refresh our fleet, we started looking at what our options were. As we narrowed down the options, we partnered with Brendan Foot Hyundai who took the time to understand our business and put forward the best solutions. We have now migrated the majority of our fleet to Hyundai, with us operating i30 and i40 wagons along with iLoad vans. We chose Hyundai for the feature rich specifications, including safety and reliability, while we also took the opportunity to switch entirely to diesel fueled vehicles for what has proven to be excellent economy. Nothing else stacked up as well as the Hyundai offering when everything was taken in to consideration. The fact the vehicles are all so well equipped and good on the road has seen staff embrace the change. Despite some initial concerns about the diesel side of things, staff quickly adjusted and now enjoy the fact they don’t need to refuel anywhere near as often as they used to. The change has been so successful that as we replace vehicles now, we don’t look beyond Hyundai where Brendan Foot Hyundai continue to deliver superb levels of service from end to end.